Beware the Ides of March, warned Shakespeare. And maybe the Lady Griz of March as well if Wednesday night was a sign of things to come. 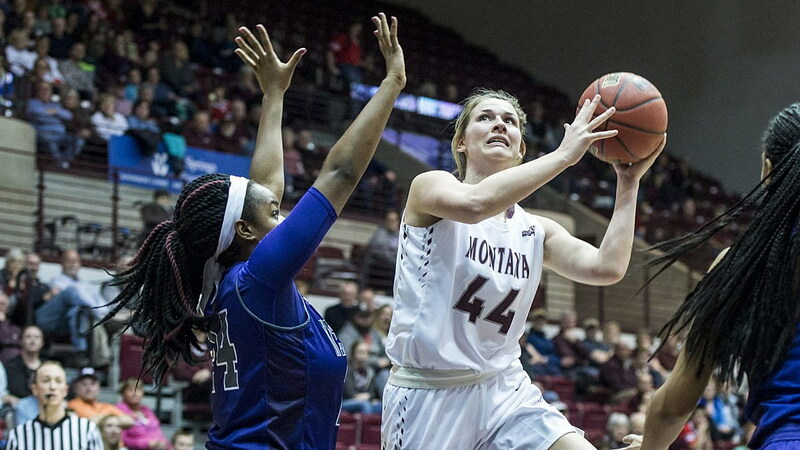 Madi Schoening scored 19 points and Montana played its most complete game of the season, running away from Weber State for a 71-46 win at Dahlberg Arena, its third straight victory at home. The Lady Griz (6-22, 3-14 BSC), who are now locked into the No. 11 seed at next week’s Big Sky Conference tournament at Reno, led by double digits the entire second half and set a season high for points scored. It was Montana’s sixth win of the season but the only one that didn’t come with a heavy dose of edge-of-your-seat, white-knuckle drama. The Lady Griz led 33-21 at the half, 56-34 at the end of three quarters and built a 30-point lead in the fourth. “Even the games we’ve won this year, it’s come down to the last minute and been stressful,” said Schweyen, who used the opportunity to get her five bench players extensive playing time. Schoening missed three shots in the opening four minutes of the game as Weber State built a pair of early four-point leads. That was about the extent of the negatives for Schoening or for the Lady Griz. Sparked by Sierra Anderson‘s aggressive play on the offensive end, Montana closed the first quarter on a 16-1 run. Gabi Harrington, another reserve, scored the first basket of the second quarter to make the run 18-1 and put Montana up 22-9. Montana’s bench would score 35 of the team’s 71 points in the game, with Anderson leading the way with 14. Schoening scored her team’s final five points of the first half to send her team into the break up a dozen. Of course Montana also led at the half at Montana State on Saturday, though not nearly as comfortably, and ended up losing by 17 points, so Schweyen understandably stressed the start of the third quarter to her players in the locker room. “It was nice to be on the flip side of that,” she said. “We talked at half about not allowing them to come out and get anything going. We wanted to be into it right away, with no easy buckets for them. Schoening made sure of it. She splashed a 3-pointer in the opening minute of the third quarter and would score Montana’s first 10 of the period. With her five to close the first half, she scored 15 straight points for the Lady Griz, from the arc to finishing at the basket. She also grabbed nine rebounds, one off her season high, all in just 21 minutes of court time. Behind McKenzie Johnston and Emma Stockholm, Montana scored the final seven points of the third quarter, then scored the first eight of the fourth, on baskets from four different players, to blow the game open. Weber State was playing without its third-leading scorer, sophomore guard Yarden Danan, who is one of the Big Sky’s better 3-point shooters. The Wildcats hit 10 3-pointers in their 74-58 win over the Lady Griz back on Dec. 31. On Thursday, Weber State was 1 for 20 from the arc. But it was more than that. Montana is just a different team than it was in 2016. Pressure that got to the Lady Griz in Ogden on New Year’s Eve was handled with aplomb by Johnston and Anderson at the point. They turned the ball over just four times between the two of them while playing 28 and 29 minutes. “Against that lineup, it’s nice to have two people who can enter, because that’s some heavy pressure,” said Schweyen. “Those girls are quick and in your shorts the entire game. Both of them did a good job taking care of the ball and getting us organized. It was Anderson’s best scoring game of the season. Stockholm, who banked in a 3-pointer in the first half, the first indication that it was going to be Montana’s night, had six points and grabbed a season-high nine rebounds. Coming off the bench for the second straight game after starting the first 18 she played in this season, Mekayla Isaak had eight points on 4-of-4 shooting, a team-high five assists and three boards. Montana held Weber State to 27.6 percent shooting, the Lady Griz’ best defensive effort of the season, and finished +18 on the boards, its best performance since the season-opening win over Great Falls back on Nov. 15. Schoening and Stockholm led the way with nine rebounds each. “They don’t have a lot of size with the lineup they went with tonight, so we wanted to make sure we were crashing the boards,” said Schweyen. Emily Drake led Weber State with 19 points but needed 18 shots to get there. Deeshyra Thomas finished with 13 points, four rebounds, three blocks, two assists and a steal. Montana will be the No. 11 seed at next week’s Big Sky tournament and will play the No. 6 seed at 9 p.m. (MT) in Reno, but that opponent won’t be known until the dust clears after Friday’s night’s final six league games. In other Big Sky games on Wednesday, Northern Colorado won 57-50 at Portland State, Southern Utah won 64-63 at Eastern Washington, and Northern Arizona won 76-61 at Idaho. North Dakota won 92-78 at Sacramento State to remain atop the Big Sky standings by a game over Montana State, which won 73-67 at home over Idaho State.